Inexpens Inky is an easy solution to test and collect fountain pen ink. For as low as €12.50 a month, you can get 5 fountain pen ink samples delivered to your door. No hidden costs or shipping charges, the monthly subscription includes worldwide shipping. 5 fountain pen ink samples a month is great, but Inky aims to offer so much more. Inky members get monthly special discounts and promotions, and can even claim free worldwide shipping on any other orders. Hassle Free: Your ink samples are automatically shipped to you each month. Both membership levels bring the exact advantages in terms of promotions, discounts, and free shipping. They also share the exact same inks every month. The only difference is on the ink samples size. The Ink Explorer subscription is an affordable way to test 5 colors a month. 1.5ml is enough to fill 3 standard cartridges or converters, so it’s the perfect way to test new inks. The Ink Collector subscription is perfect for those who want to test and collect ink. 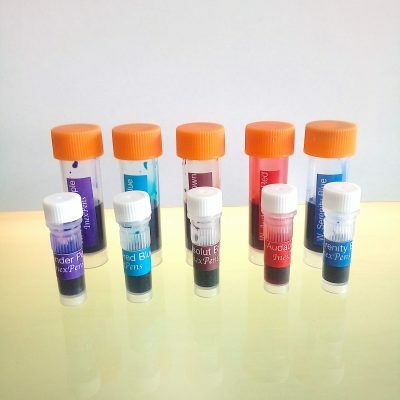 5ml can last a long time, so collecting these jumbo sized ink samples is a perfect alternative and much more affordable than collecting full-size ink bottles. Which colors will I get? Every month we’ll choose 5 colors for the Inky members. Our goal will always be to provide you with the diversity you’re looking for. So we’ll always try to add different shades and different ink brands every single month. We start shipping the next monthly ink samples on the 24th of every month. So, on the 24th of March, we start sending April monthly ink samples. No matter when you sign up, we’ll ship your first ink samples starting on the next day 24. But what if I sign up on the 25th or 26th day of the month? You can sign up anytime you want, but since we start sending the monthly ink samples on the 24th of the previous month, we can’t accommodate your subscription and send you this month ink samples right away. You’ll be billed monthly, so you will get a package of 5 ink vials for each month you’re subscribed to Inky. But, no matter when you subscribe, the first ink samples will always be shipped on the next 24th. We use 1st priority mail for Inky, so it takes up to 5 days to be delivered in Europe, and up to 7 business days to be delivered Worldwide. No, you can sign up or cancel anytime. The subscription is handled by PayPal, so you can cancel it anytime, or if you need assistance, we’ll make sure you won’t be billed anymore. Can I choose or swap any ink colors? Unfortunately no. Inky doesn’t allow you to choose a specific color and we can’t really replace a color. If you don’t like a specific color you got, or if you already have it, you can try to exchange it with another person, or simply give it away. But we can’t really offer that kind of personalization. We simply try to send great ink samples in an affordable way, and we’ll give our best to provide you with the diversity you’re looking for. But it’s impossible to accommodate every customer collection or tastes, and send you exactly a unique color package just for you. Part of the fun of this kind of service is exactly the surprise factor on getting new inks, without even knowing what to expect. So, give it a try, and if you don’t like it, you can cancel anytime. When will I get the exclusive deals and discounts? We’ll send you exclusive discounts and deals right to your email every month. We’ll give our best to give you the time to take advantage of them, and combine them with the next Inky delivery so that you can get the best of both worlds and take advantage of the free shipping. How exactly does the free shipping work? As an Inky member, you’ll get a coupon that offers you free shipping. When you want to, you can use this coupon and we’ll send your products for free on the next Inky delivery. If you’re on a rush and don’t want to wait for the next Inky delivery, you can order the products without the coupon, and we’ll ship it right away, just like we do on any regular orders. If you want to take advantage of the free shipping, we’ll combine your order with the next Inky delivery, and you’ll get everything without paying for shipping.